A nasty summer flu knocked me out so there hasn't been much crafting in the last few days. However this I managed to put together, inspired by the Deep Ocean Photo inspiration image. I'm also entering my card into these challenges: Inspiration Destination (ATG), Simon Says Wednesday (ATG), Creative Knockouts (ATG), Penny's (ATG) and The Paper Shelter (ATG). Aivan ihana kortti! Pikaista paranemista! This is so pretty! 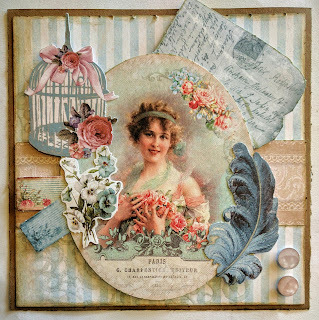 Love the vintage theme and all the kewt embellies. Thanks for sharing at Inspiration Destination and hope to see you again. Good luck. nice work! Thanks for joining us at Inspiration Destination. Good luck.